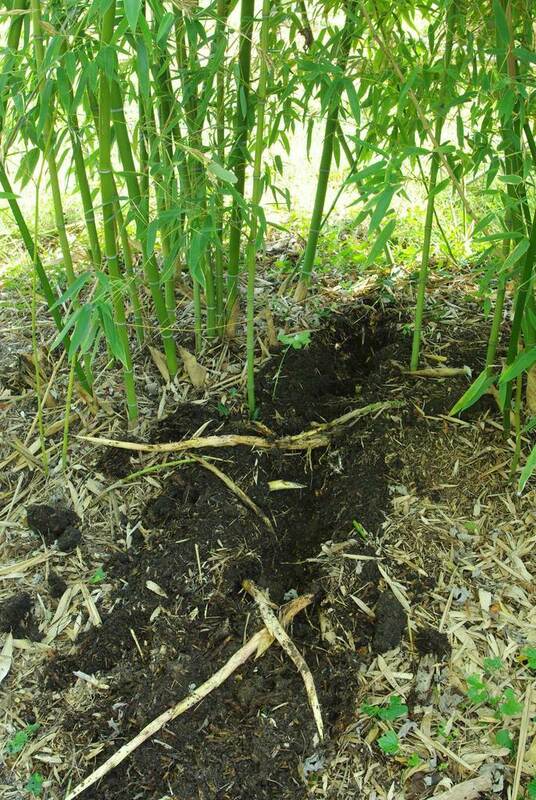 I've been fighting with one of my bamboo plantings this year: as it got taller, it got droopier. 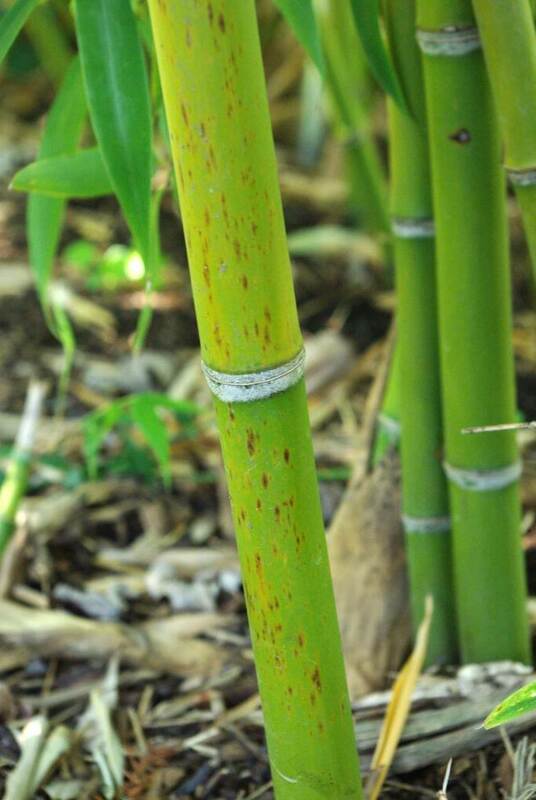 It turns out that this particular variety has curvy culms (canes) that weep, which is quite attractive in the right space. 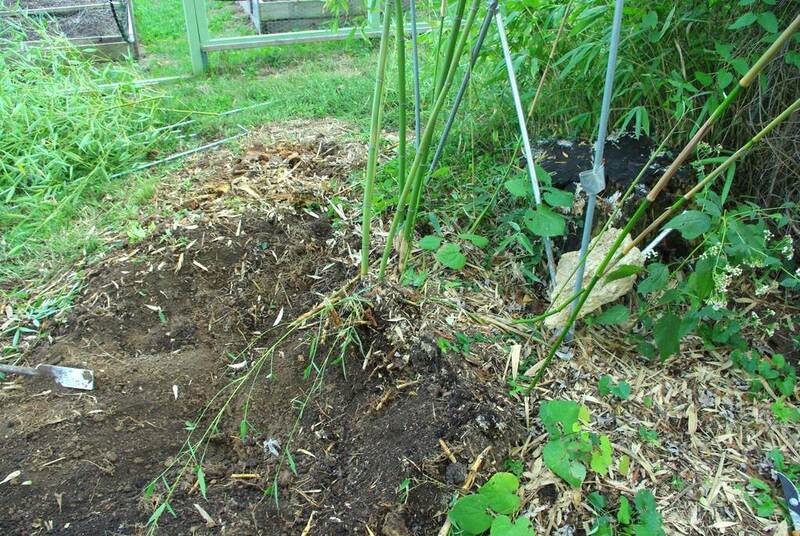 I don't have the right space because of limited room, so I've done several things to help keep the culms more upright and out of my neighbor's garden: pruned the tops to lighten the load, tied culms together, even built a support "cage" to help keep them in place. 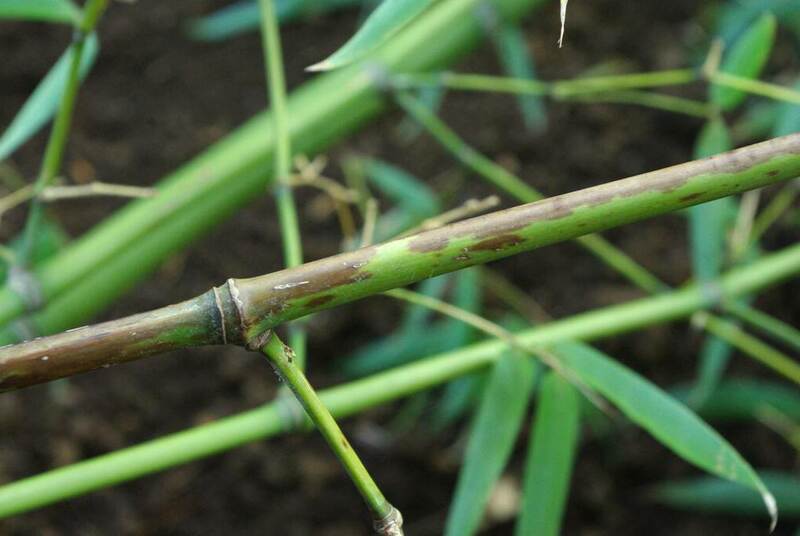 Although this bamboo has been sizing up very nicely and producing some beautiful culms, fighting with it has been a major negative. 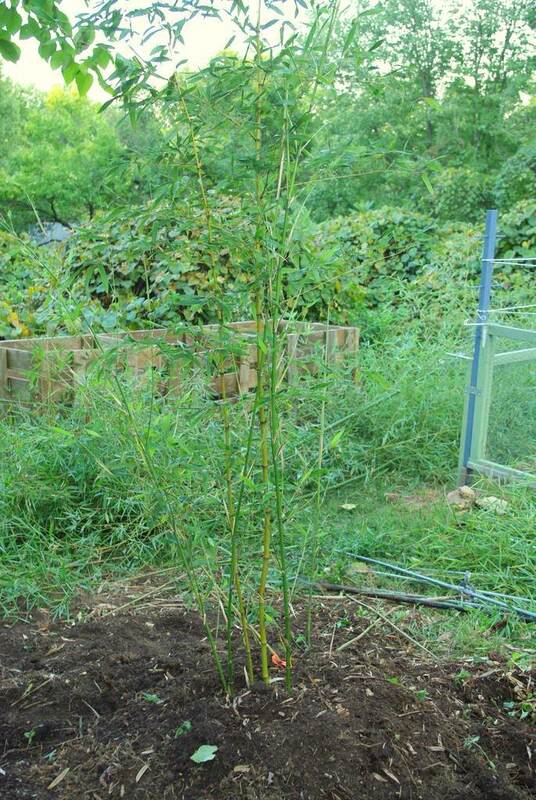 I've been considering removing the plant and putting one of my other bamboo species there instead, and yesterday I finally made up my mind and just did it. 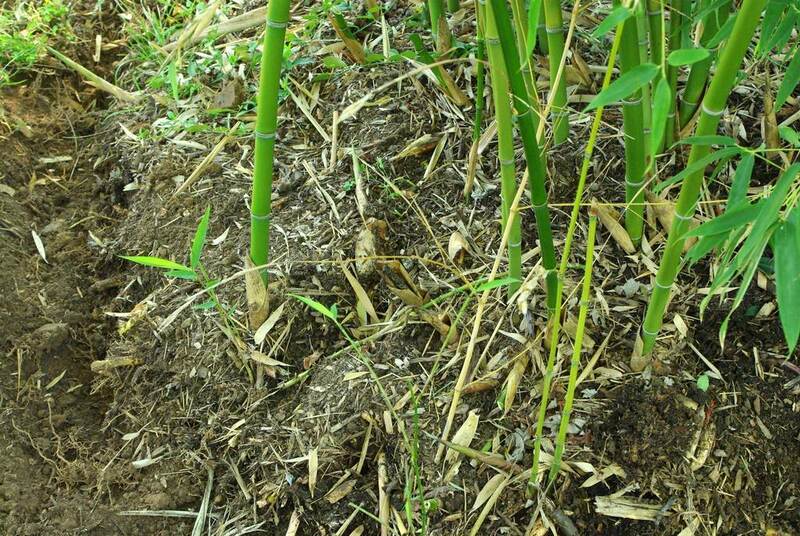 I didn't create a timelapse video as I did the other time I removed a bamboo from my garden, but here's the whole process. 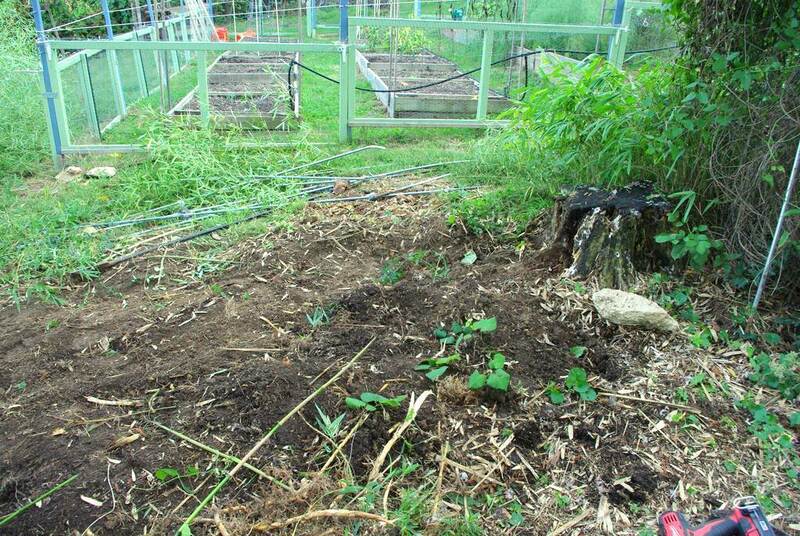 I should point out that I wasn't going to just cut the entire plant down then dig up the rhizomes and discard them. My goal was to dig divisions that I could sell cheaply or give away. 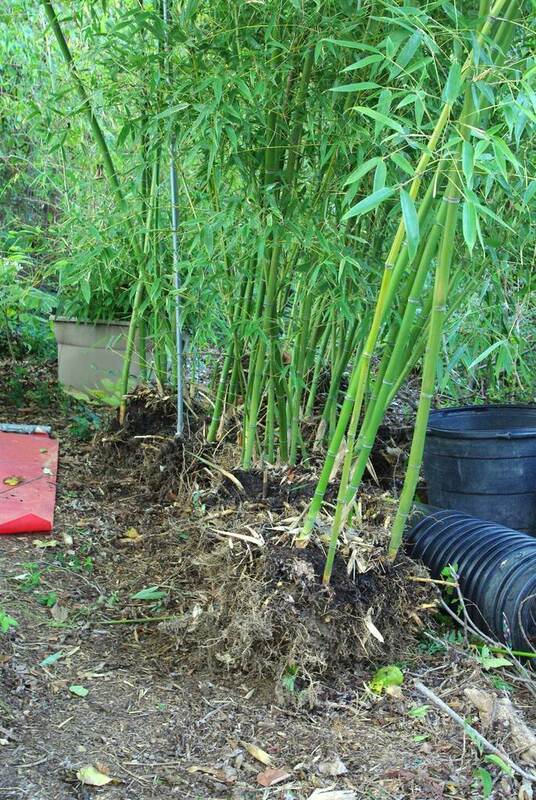 Even though this variety (Phyllostachys glauca 'Yunzhu') doesn't work well for my space, it could certainly work for somebody with more room. Another year or two and it seems like it would be much more prominent, but no second thoughts -- this plant will soon be gone! 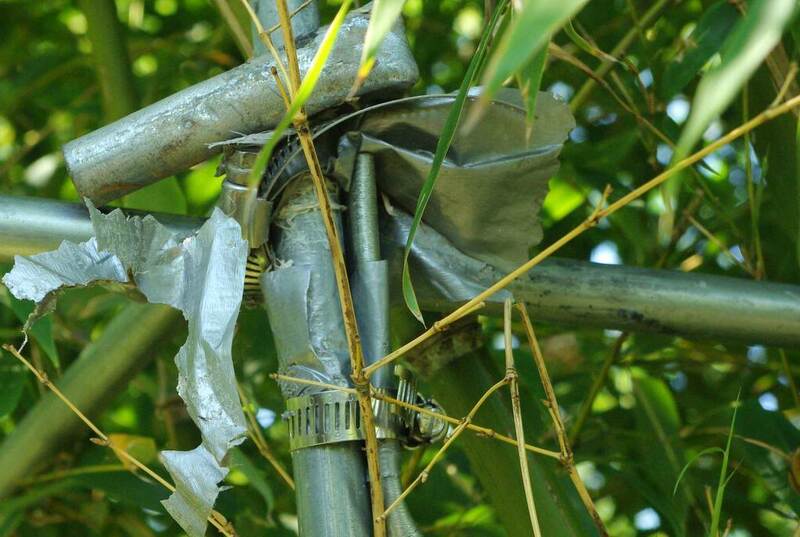 Despite how ugly this looks, the duct tape had degraded and was flimsy and the hose clamps came off easily. I'm glad to have this monstrosity gone! 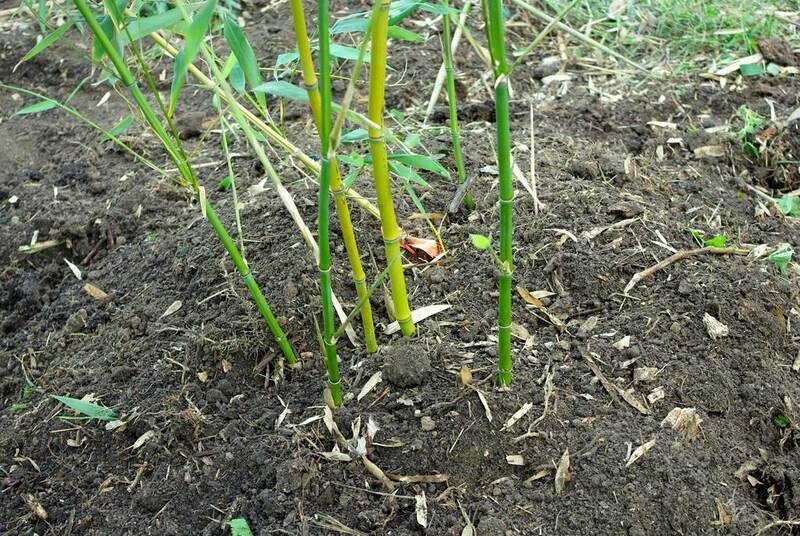 Our very dry summer kept the rhizomes from growing too much until recently, so they're shorter than they have been in past years. Normally this would be a bad thing, but this makes it easier for me now. These all got chopped off. From my past experience taking divisions from Michael's very old bamboos, I expected this to be a difficult fight. 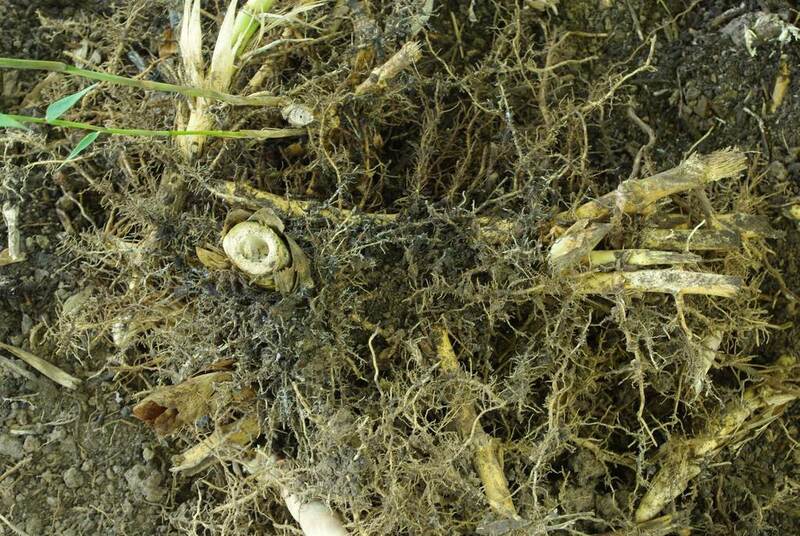 His plants had so many levels of woody rhizomes overlapping, it was often like cutting into a block of wood when trying to divide. This was so much easier! 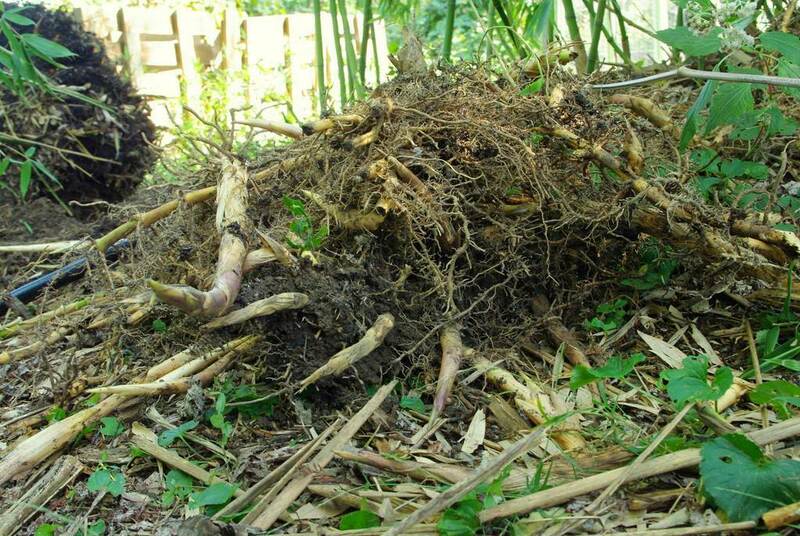 I pulled a lot of rhizome sections out, and started piling them up. If this were spring (before shooting) I'd pot some of these up to make new small plants out of them, but at this time of year their energy reserves are very low so they will most likely die in the ground. Into the compost pile they go! I then removed some portion of the tops of each culm. The tallest were about 18' (5.5m) tall, so I trimmed them to a more manageable 12' (3.6m). 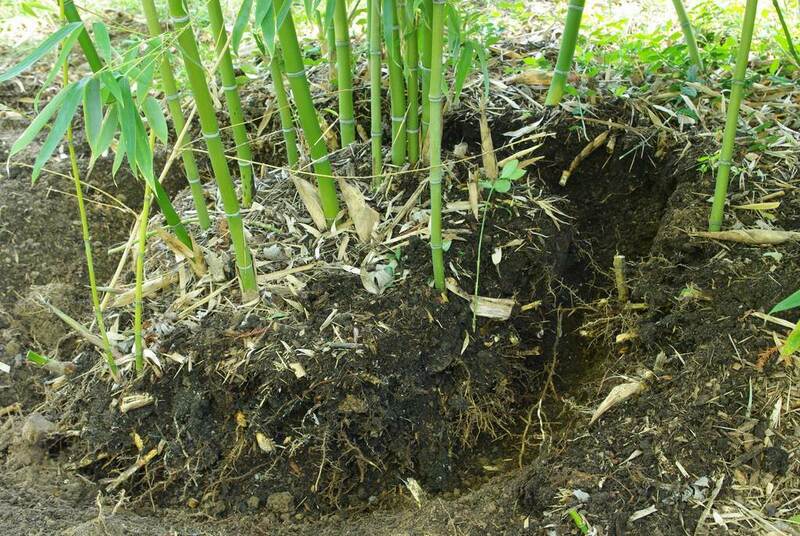 This was mainly to reduce the water needs of the divisions, as like with almost any plant division the reduced root system may not be able to support the water needs of the entire plant. 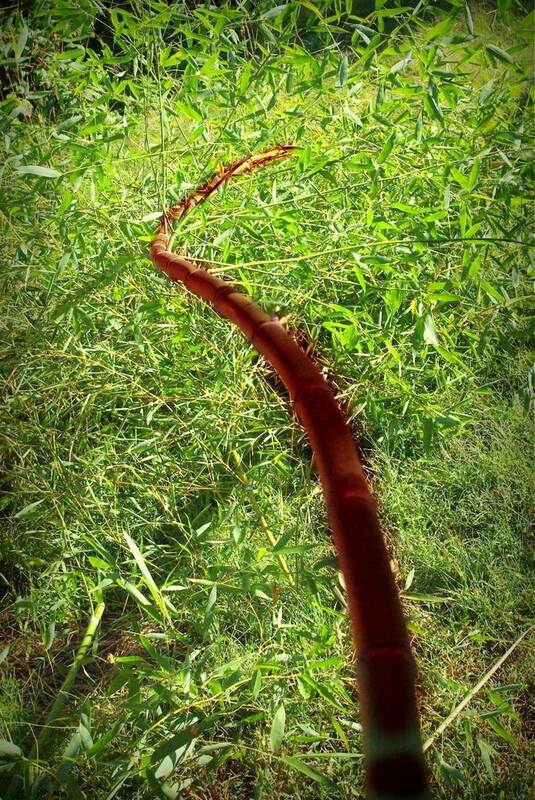 Instead of being straight and upright, the culm bends first one way then the other. This curve is accentuated by the weight of the leaves. Having trouble seeing it? 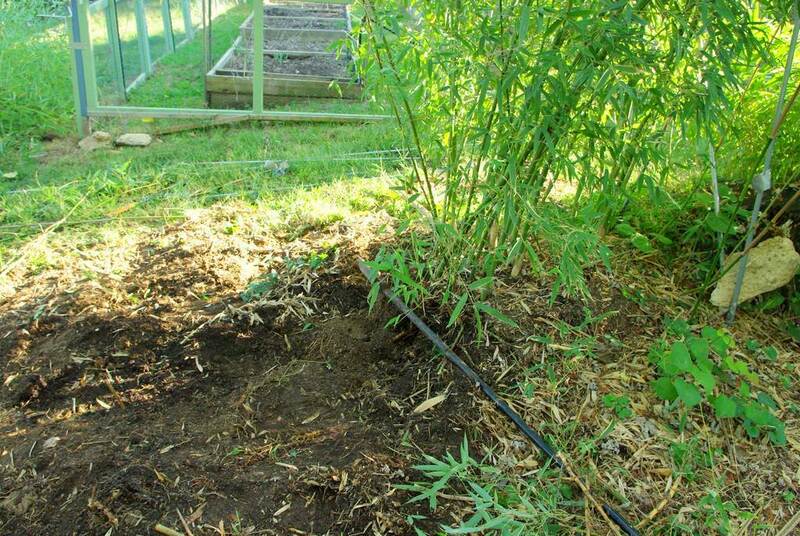 Continuing on with marking out each division, severing the rhizomes connecting it to the rest of the plant, digging around it then prying it out of the ground I made good progress. It wasn't easy by any measure, but it's quite satisfying to lean on the pry bar and have the plant break free of the soil. And then it was all clear! 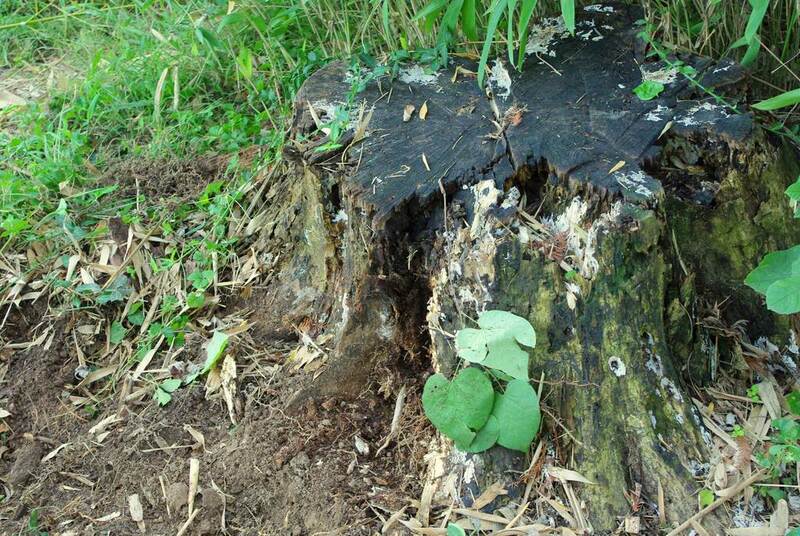 I've got some room now to work on removing this old stump! I like it, although I'll be planting a bit to the left. 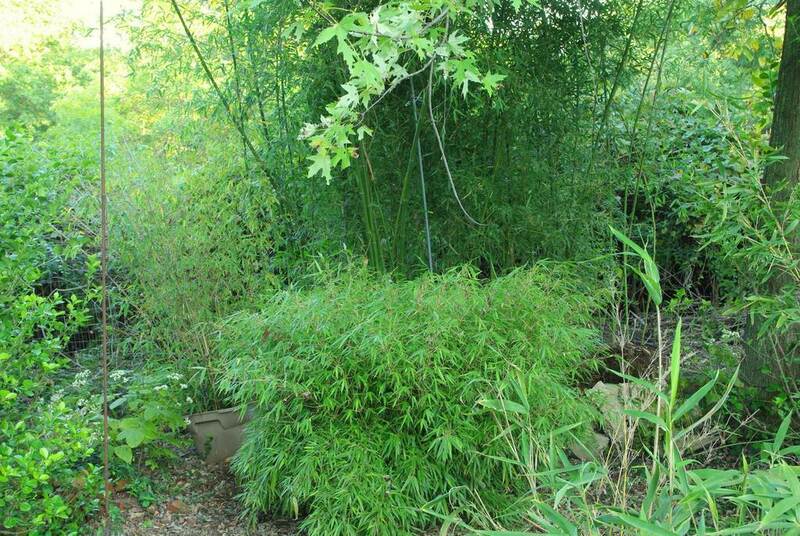 It makes a nice background to the Fargesia 'Rufa' bamboo in front of it. 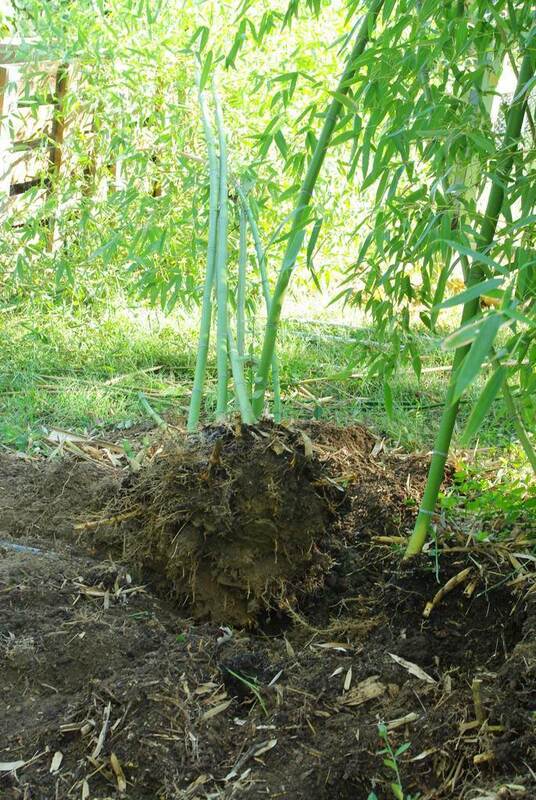 I was going to wait another day to plant the replacement bamboo, but why? 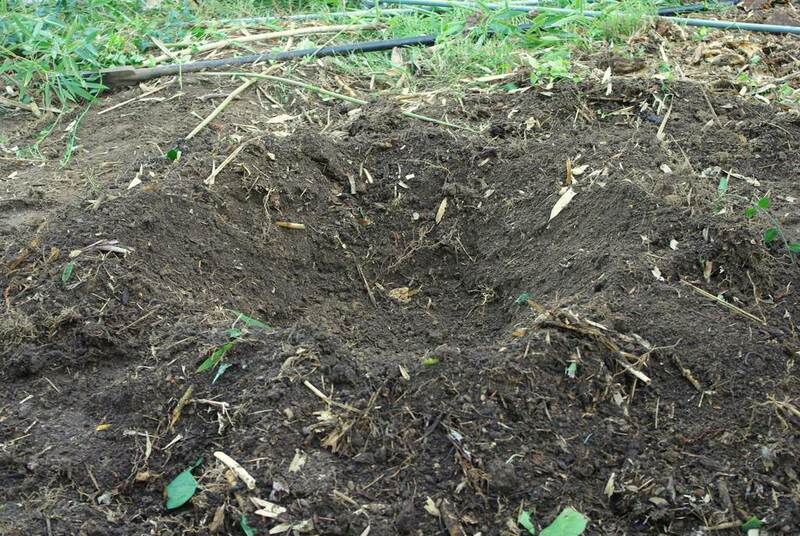 I'm eager to wrap this up, so let's plant! 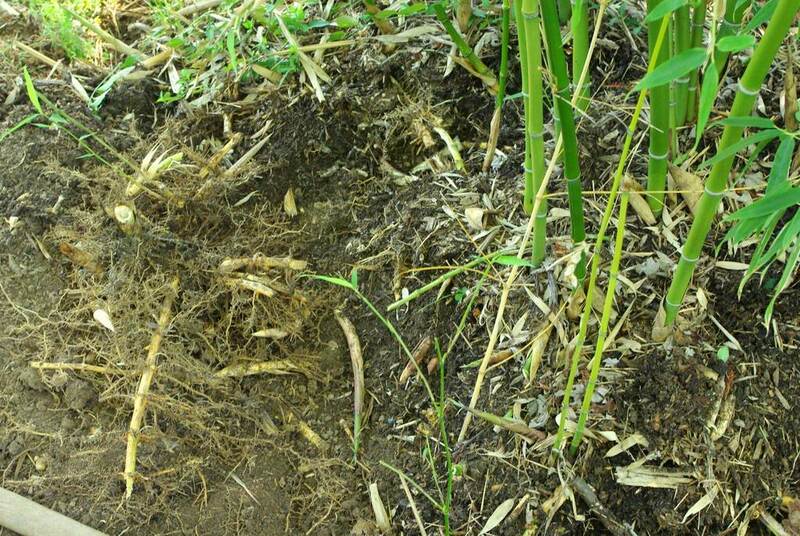 The soil here is so beautiful! 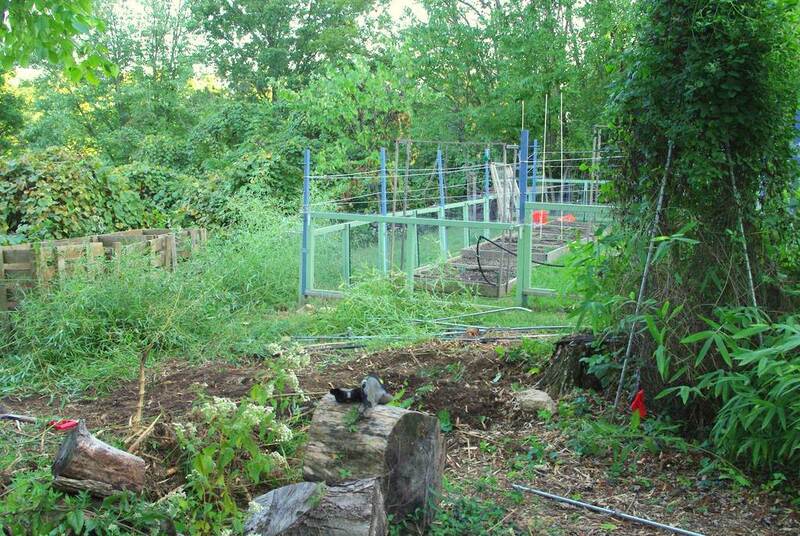 Somebody did a great job of adding compost and manure for the last few years, thank you very much. 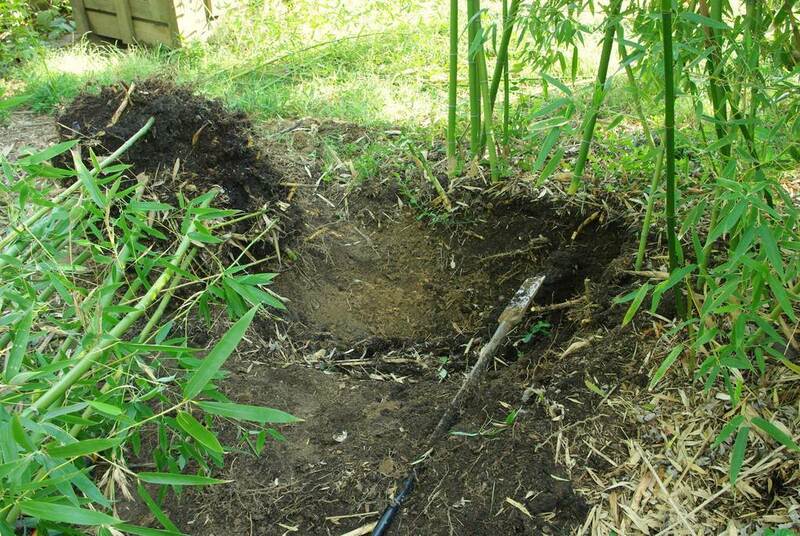 Getting a fairly large bamboo out of an 18" (45cm) pot is sometimes a fair amount of work. After a few hours of digging these divisions though, it was a refreshingly easy task. 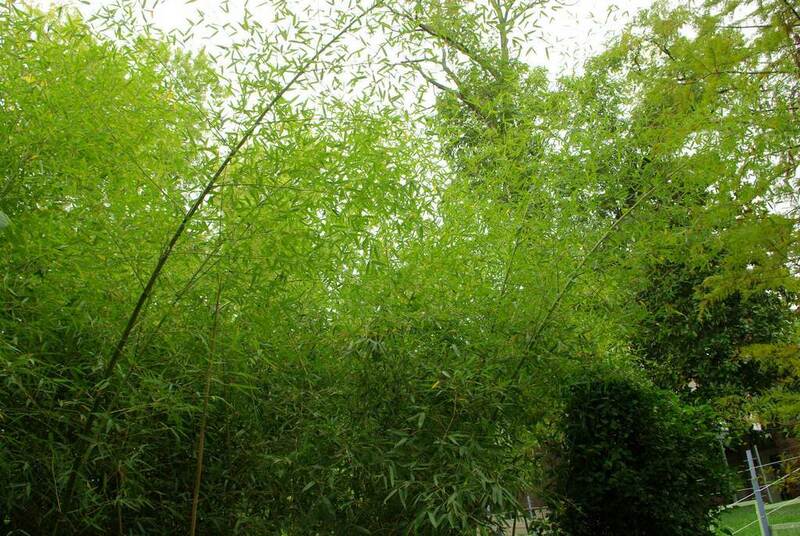 That's a good thing though -- leafy canopy means arching culms, and this variety is supposed to be quite upright. 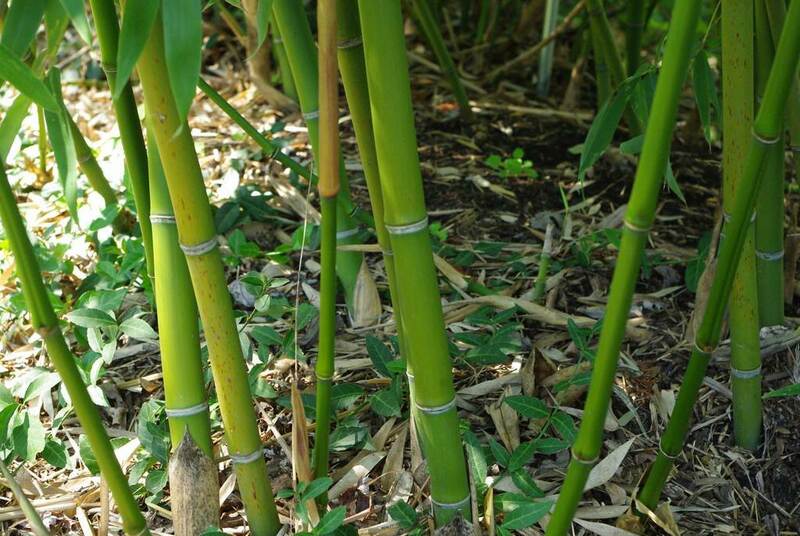 Even these smaller culms are very vertical. Now I just have to wait a few years for the size-up to start, and for this plant to spread. Sigh. 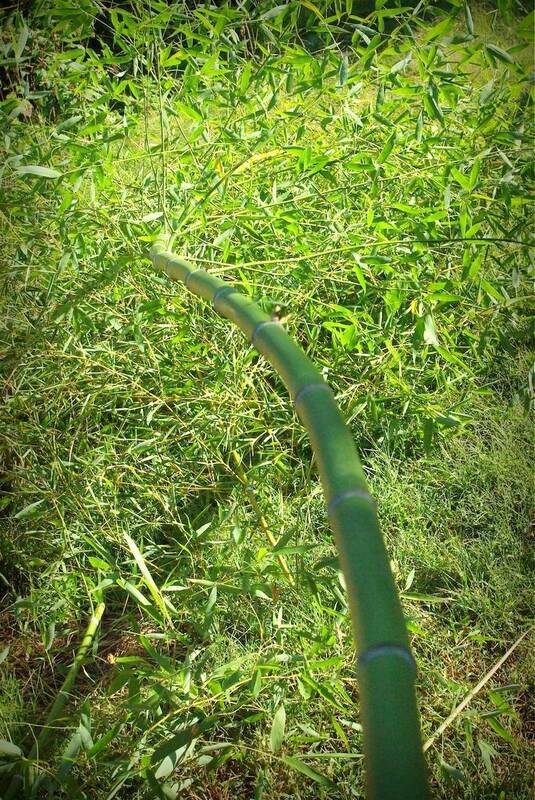 At least I've got plenty of other bamboos to get excited about while I'm waiting. 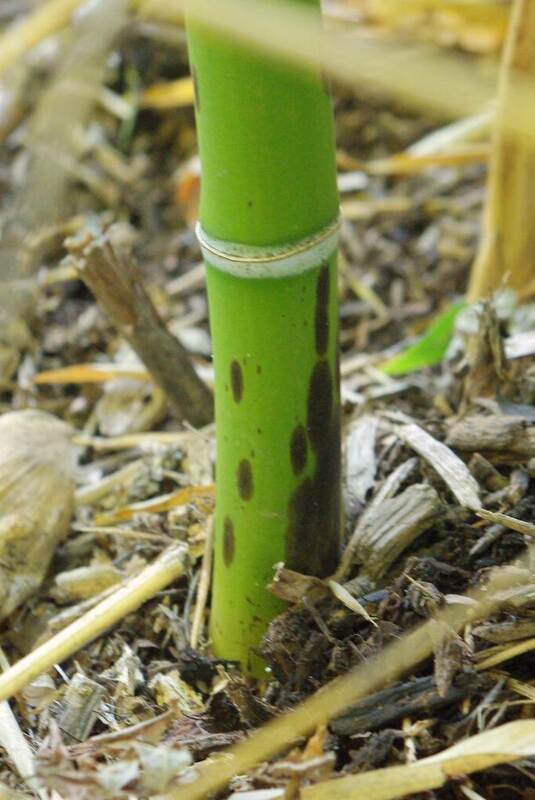 Incidentally, I've got one large specimen of the removed variety (Phyllostachys glauca 'Yunzhu') potted up from last year. I'll keep this around in case I ever change my mind about it or get more space to plant in. I've also posted an ad on Craigslist St. Louis for the divisions if you're local and interested. The spotting on your Yunzhu looks a bit like Ph. nigra 'Bory'. It would have been nice to see a mature stand, but I completely understand why you did what you did. 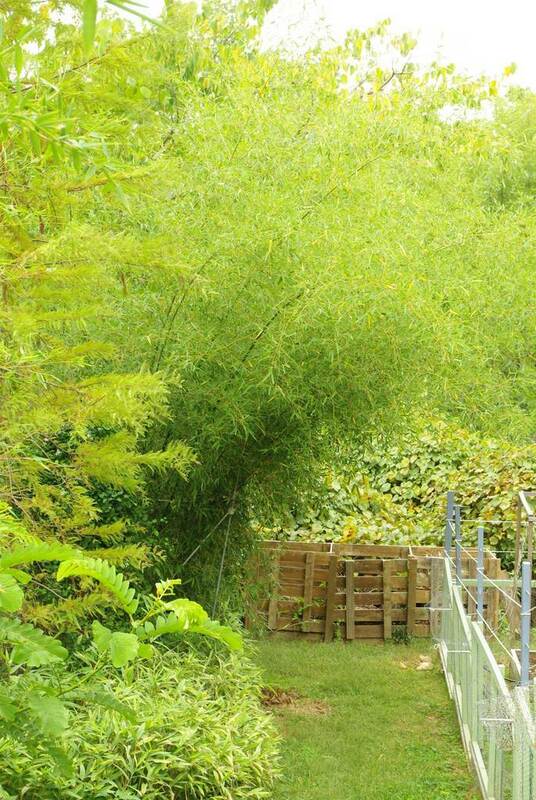 I hope you'll find somebody local who appreciates this beautiful bamboo and has the space for it. 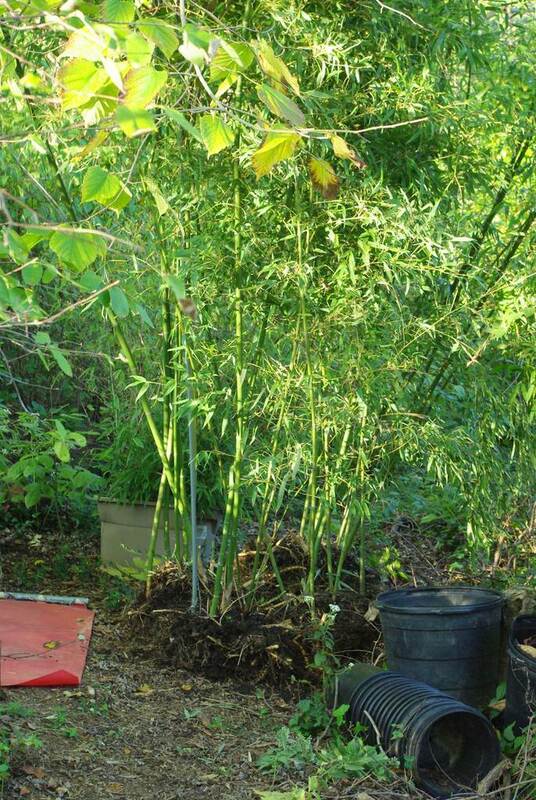 Excellent and informative post, though now I know I will enjoy Bamboo strictly in other people's gardens, not my own! that looks quite a bit different from my propinqua beijing. 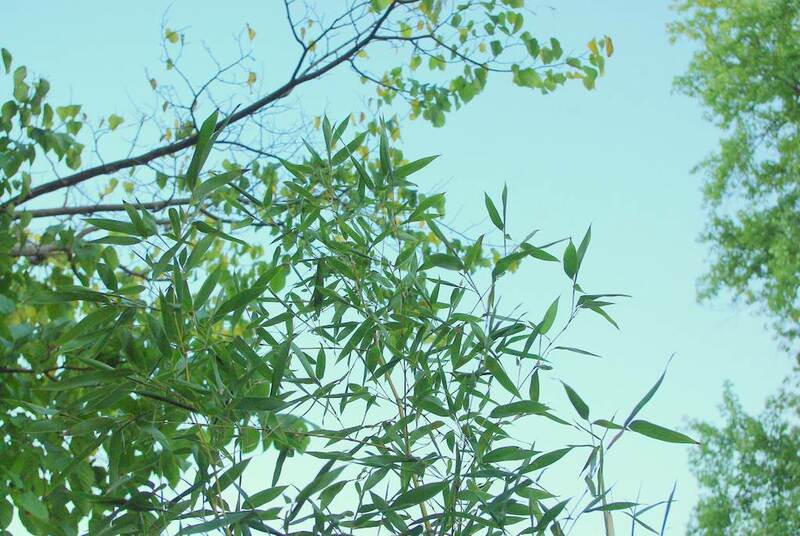 The nodes have about the same shape, but my culms stay dark green, the leaves get very dark, there is very heavy foliage, and the leaves get huge. Maybe we have different cultivators, or it might be environmentally related, but that doesn't seem to be an exact match to what I have. It was growing in a pot for 3 months back in 2010, but it quickly got stressed for water so I ended up planting it. I'll be interested to see if yours ends up getting closer in appearance to mine. One thing that is in common is the late shoots and overall form so the difference could be environmental.